Today, this lovely Friday in Spring, I get to begin a new project. I am to create several dresses and other pieces of cotton, linen, and silk fabrics in various warm and bright colors... Spicy, fresh colors. One of my loveliest clients lives in a sunny, bright land of palms under azure sky. She has commissioned me to create a chic and sophisticated set of custom made garments that will dress her up for all sorts of Spring and Summer days. 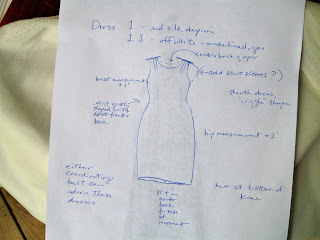 I am going to sketch the dresses, skirts, and tops here and will show the fabric options. 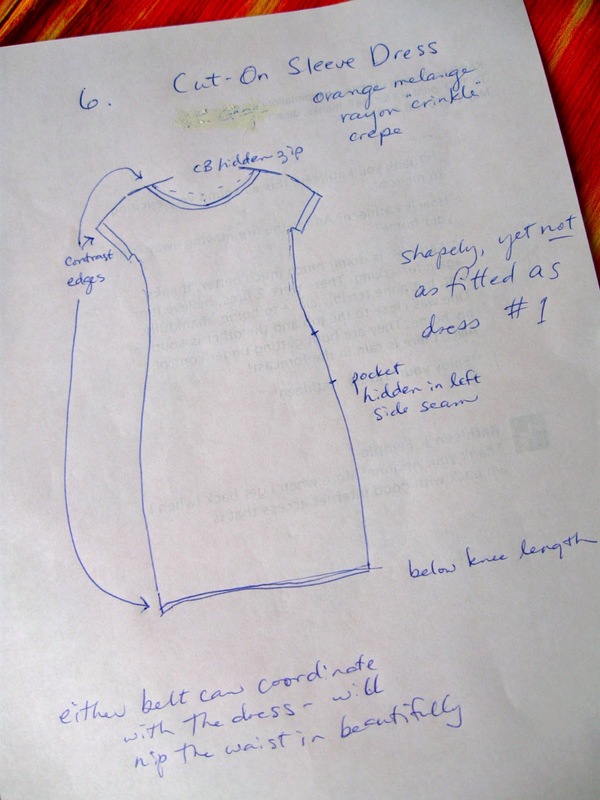 My client can therefore see some of her choices and others can watch the development of a custom garment project. Dear A., please respond in the thread of our facebook messages; I will label the various designs and fabrics for easy reference. Light and sort of sheer orange knit is at least partly synthetic, but I think it would be quite comfortable to wear, given that it is so light. 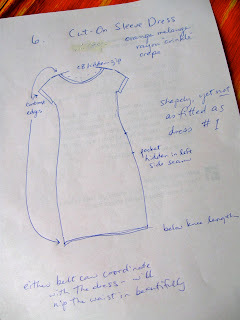 It would be tuck-able or could be worn untucked with a belt to define the waist. Silk crinkle charmeuse... off white.... The glossy side could be used for a second of the tops, if you like. The matte side is nice too. 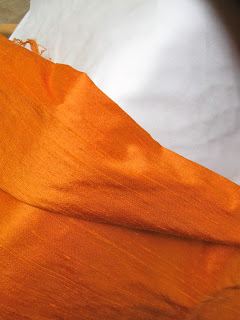 I picked out the silk as an accent piece, actually (for the orange melange dress, see below) but purchased enough to make a little top too, if you would like that! 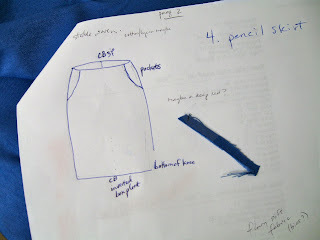 4-- Pencil skirt-- This vibrant colored skirt could be made of the deep royal blue that we discussed before OR it could be made of the deep vibrant dark red. 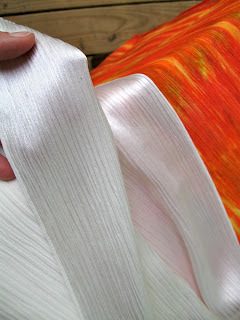 The pics below show the two fabric selections I like best for this skirt. 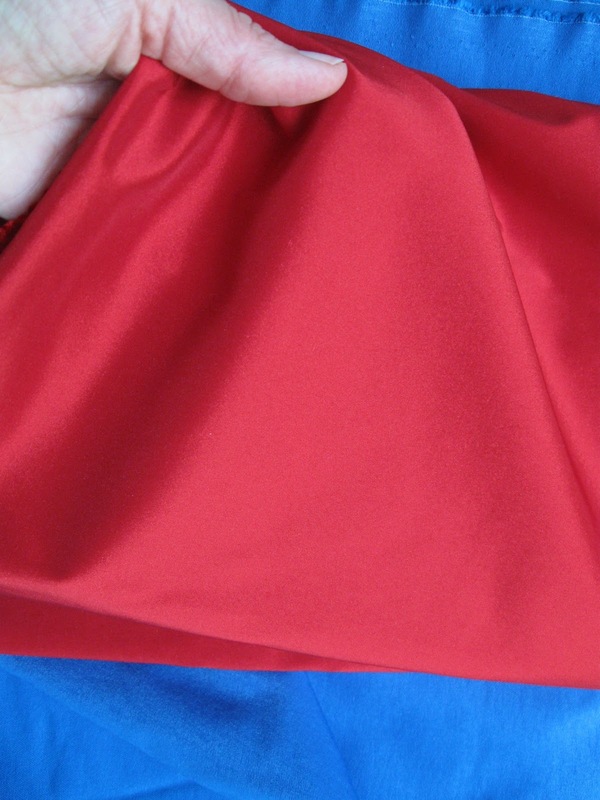 The fabrics are synthetic, at least in large part, but they contain lycra for good horizontal stretch that would be less likely to stretch out in the seat (thanks to the synthetic content, actually). I have enough of both of these fabrics, in case you want one in each color. 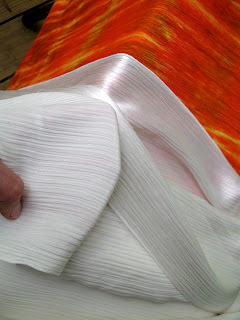 Both of these skirt fabrics would go well with the lightweight orange knit as well as with the off white silk crinkle charmeuse. 7-- Fabric belts, obi style. I could make two obi style belts and both of the belts would be reversible, so as to maximize their usefulness in this set of great garments. First, the fabrics I suggested for the skirts; I have enough of each for the obi belts. 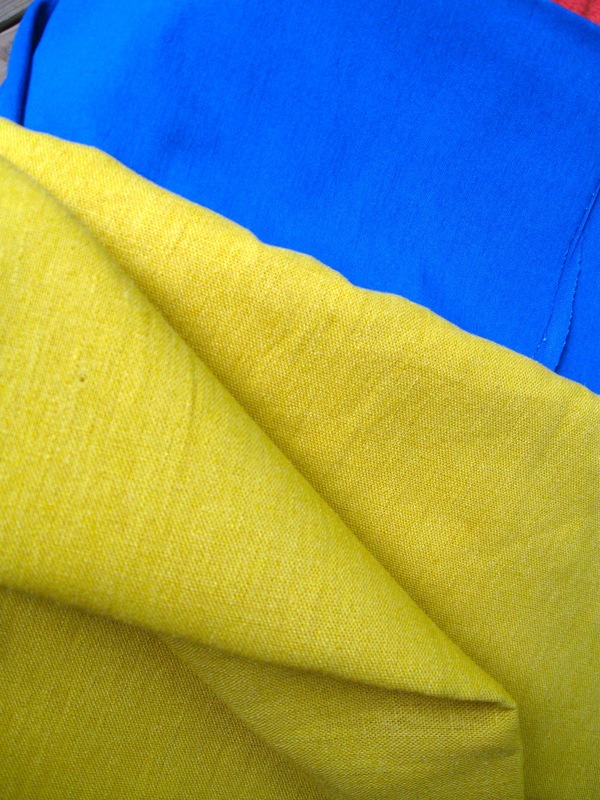 I also picked up a golden yellow linen/cotton fabric that I liked so much for the reverse side of the blue. .... and an orange silk dupioni that would also work for the reverse of the blue. 8. 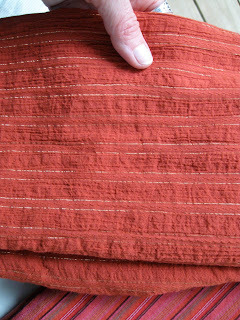 Knit tee ensemble-- I saw a lovely jersey stretch knit in (mostly) black with a border print that features all the colors we are working with here.... Would you like a short sleeved tee with coordinating straight skirt made of this fabric? The fabric is actually about 60% black but my photos make it look mostly colors. 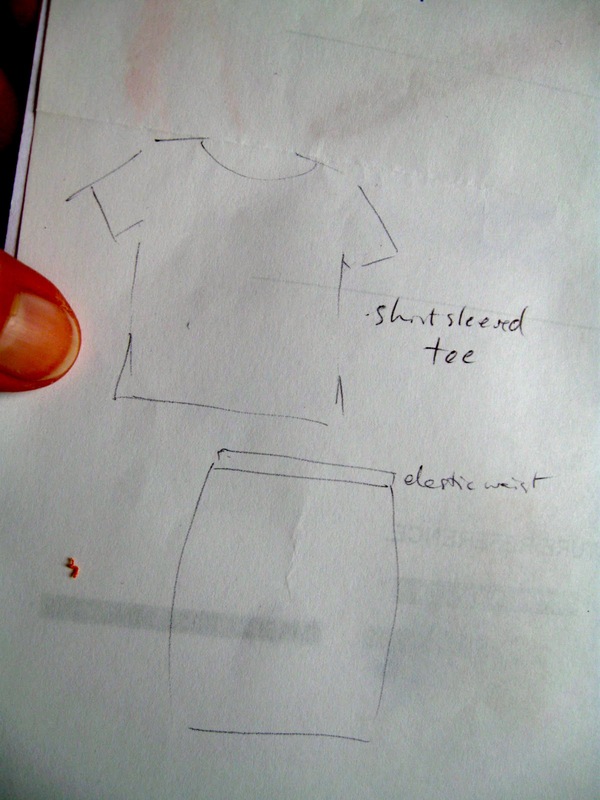 My idea is that the shoulders of the tee could be colors-intensive, as could the hemline of the skirt. If you don't want such an ensemble, it's no problem at all. 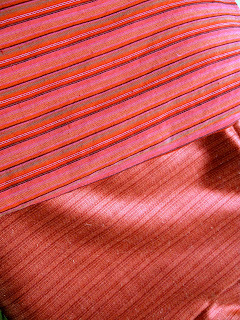 I love the fabric and I will be the buyer of it unless you do want it. 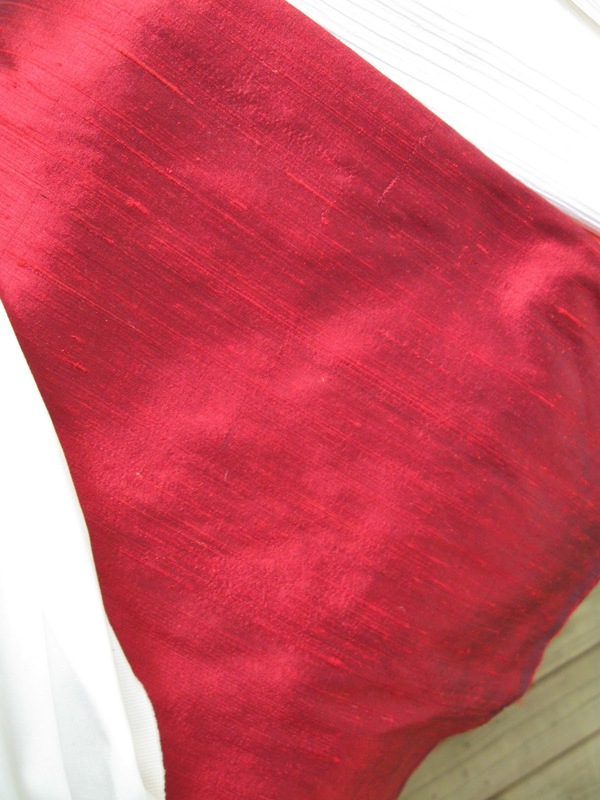 Here is a textured cotton with a gold vertical thread. And another shot of the jersey knit with border-print colors. Confetti! Or garden of zinnias! One of the most innovative designers of the 20th century, Madame Alix Gres created classically-inspired "Grecian" evening gowns, caftans, day dresses, and ponchos to astonish and inspire. Madame Gres designed gorgeous creations through the 1930s, 1940s, 1950s, 1960s, 1970s, and 1980s, dressing her clients in fabulous beauty. 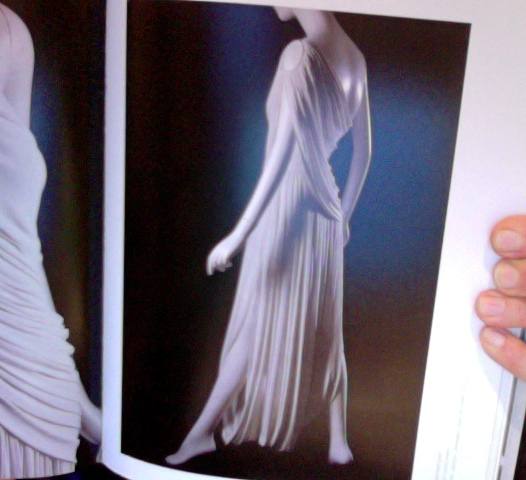 My hat is off to you, Madame Gres. I want to try my hand at replicating one of your evening gowns. 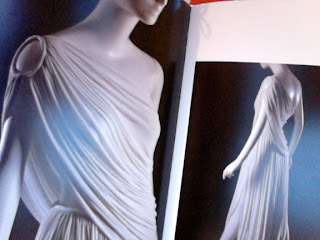 I will make my tribute to Madame Gres for one lucky person for free. No charge at all for my labor. 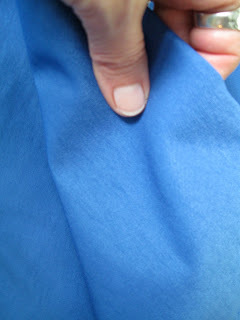 WILL SOMEONE PLEASE SEND ME a large piece of SILK CHARMEUSE or SILK LIGHTWEIGHT CREPE or SILK JERSEY? Any color. 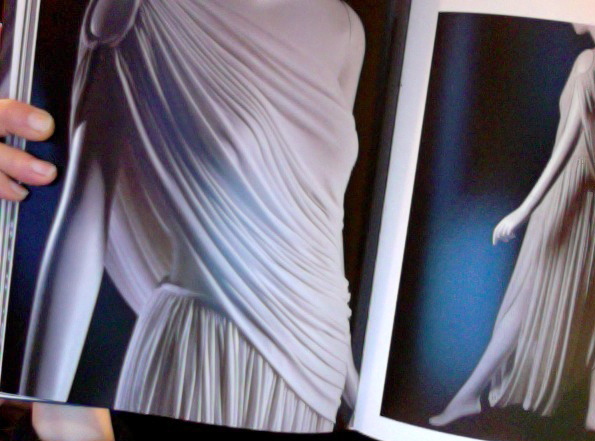 I will salute Madame Gres by crafting your silk into this design. 2. Promise to wear the gown. 3. Promise to love Madame Gres. 4. Send me at least two good photos of yourself modeling the gown. Please contact me to let me know you are sending me your silk. I will need to know only two measurements from you: your waist circumference at the narrowest part of your midriff and your inseam length*. I will send you my studio address so you can have your fabric shipped to me. 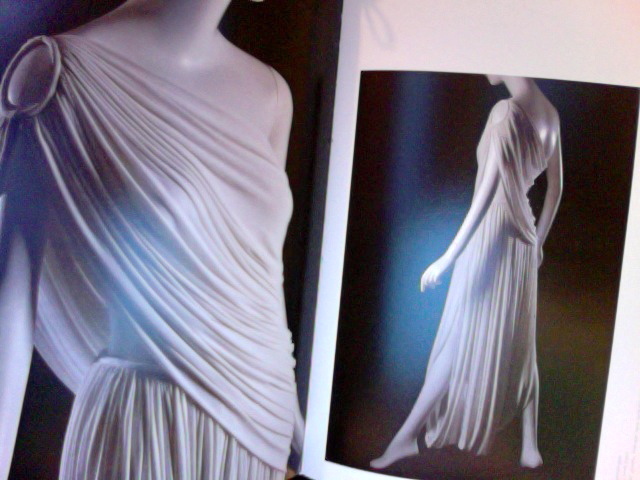 I will be able to make only one of the Madame Gres two-piece gowns on a no-charge basis. The first person who contracts with me according to the above terms will be the one for whom I make the gown. Write to me in a comment here or email me: KathleenTempleTailor@gmail.com. You may text or phone me, if you like: 540-574-4311 Don't purchase/send your fabric to me until we correspond with one another.... I may get more than one order in response to my post today, but I can do only one of the dresses for free! The above images are my own humble photos of the gorgeous photos by Irving Solero featured in MADAME GRES: Sphinx of Fashion (Fashion Institute of Technology, 2007). 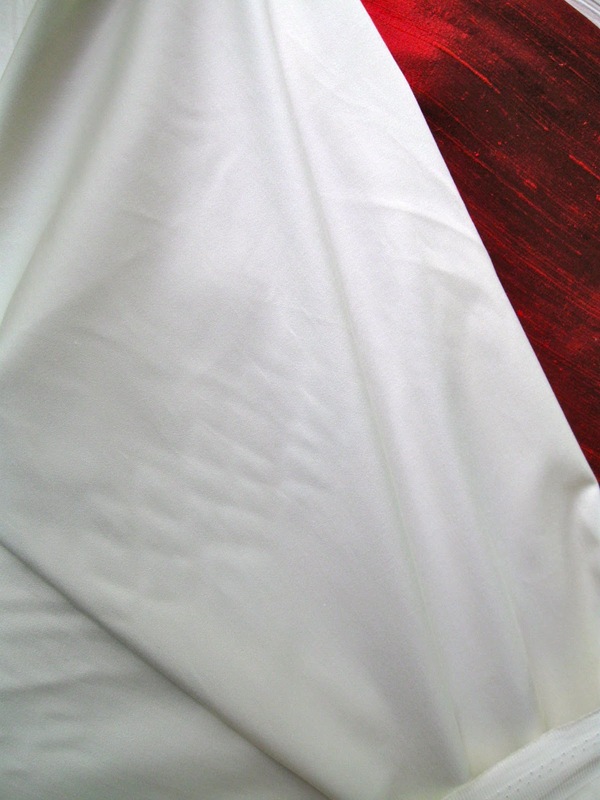 *for your inseam length, measure the inseam of a pair of pants that fit you well and that are long enough to drape nicely on the shoes that you might wear with your Madame Gres gown. I have been enjoying a new project. 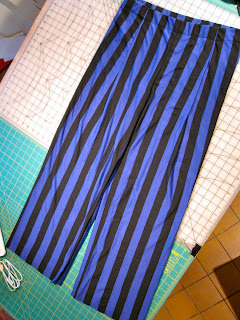 I am creating custom made pants for someone who herself plays Eridan, a character in a web comic. I love to get to make these sorts of garments that help to transform people into the web comic characters! 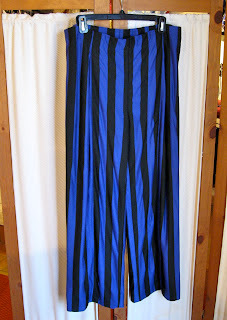 The only cobalt and black striped fabric we could find was a soft knit. 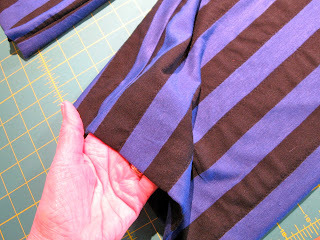 I reinforced the soft, drapey fabric by stitching it along some of the black stripes to a stretch knit underlining fabric. Eridan's pants have deep pleats in their front panels. The wide elastic band lays more smoothly than most elasticized waistbands, and I stitched the elastic inside the band so it cannot roll. These pants will be quite comfortable to wear! One of the ways I prevented the pants from looking pajama-ish was to create invisible hems. The back panels of the pants are darted for shape and comfort. When the pants are suspended from a hanger, the fabric shows its softness; when they are being worn, they will lay smoothly and Eridan-like. 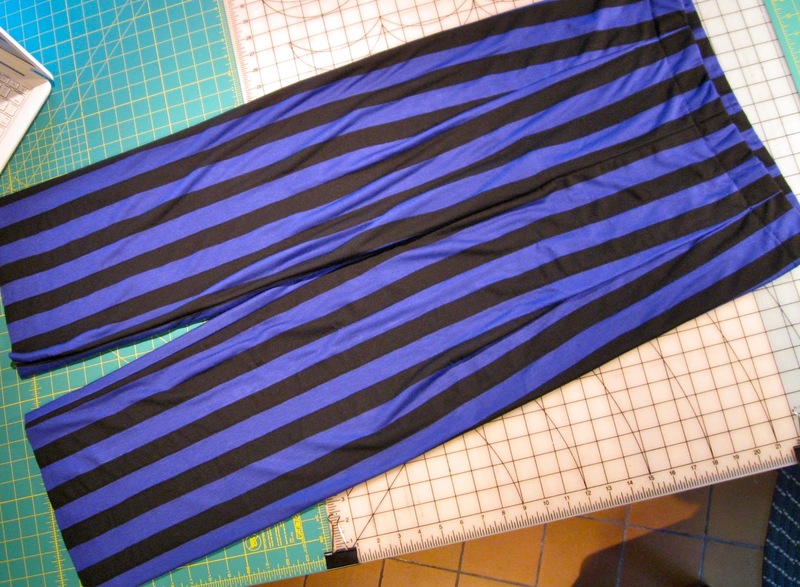 Thanks so much to my client, the Eridan-impressionist, for letting me create these pants for the web comic event! 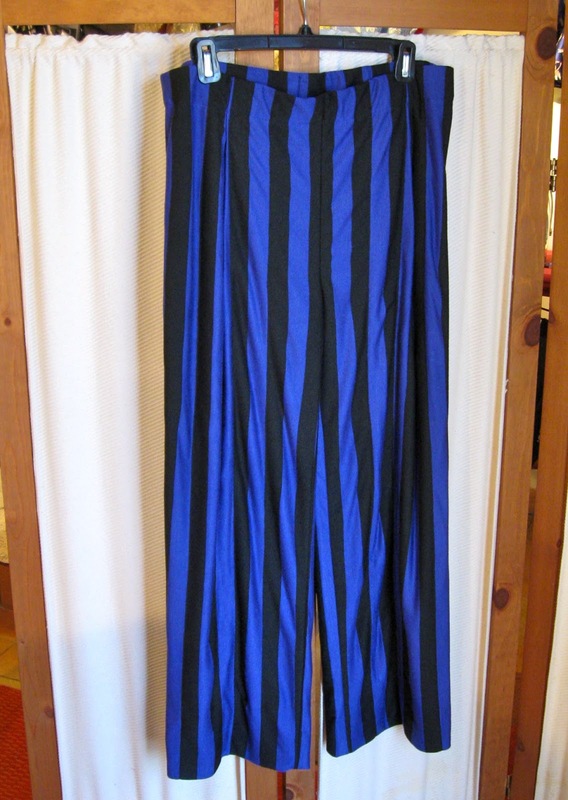 This vintage YSL swimsuit was, once upon a time, available on etsy. But might I make one LIKE it?? ?